I can confess I love corn very much. LOVE!! As you can see by the trend of my last few posts. 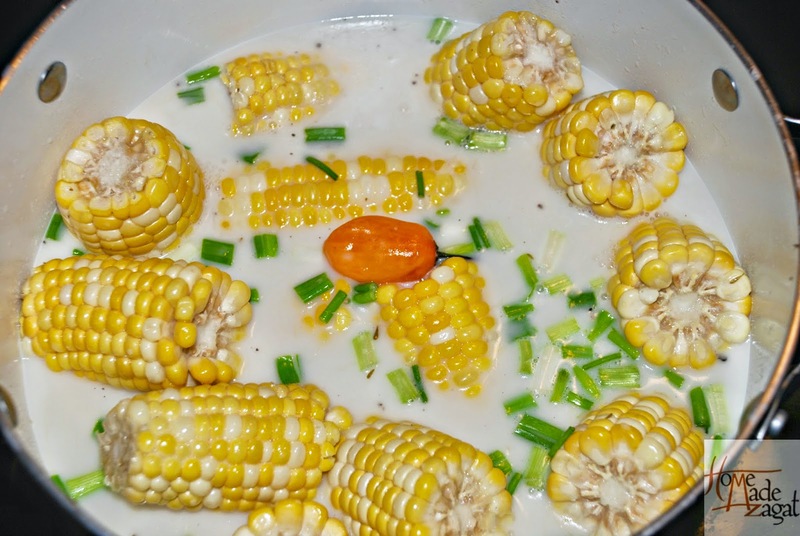 If you missed it somehow, check out my Trinidad Corn Soup post. As usual I am in a struggle with time management for work and school work has created a world of rush for me. 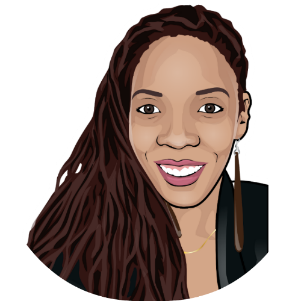 I am excitedly waiting for the end of Grad school to be able to pay lots more attention to my blog and my love for food. On Saturday it was a bit rainy here in South Florida so I decided to take a break from work of any form and make another Caribbean favorite, boiled corn. Now, we Trini and Tobagonians do not do things normally. We somehow think we need to create a whole other flavor to the most basic thing. This explains why we don't just drop our corn in water and boil but add it to a bath of flavor. Sounds fancy eh? 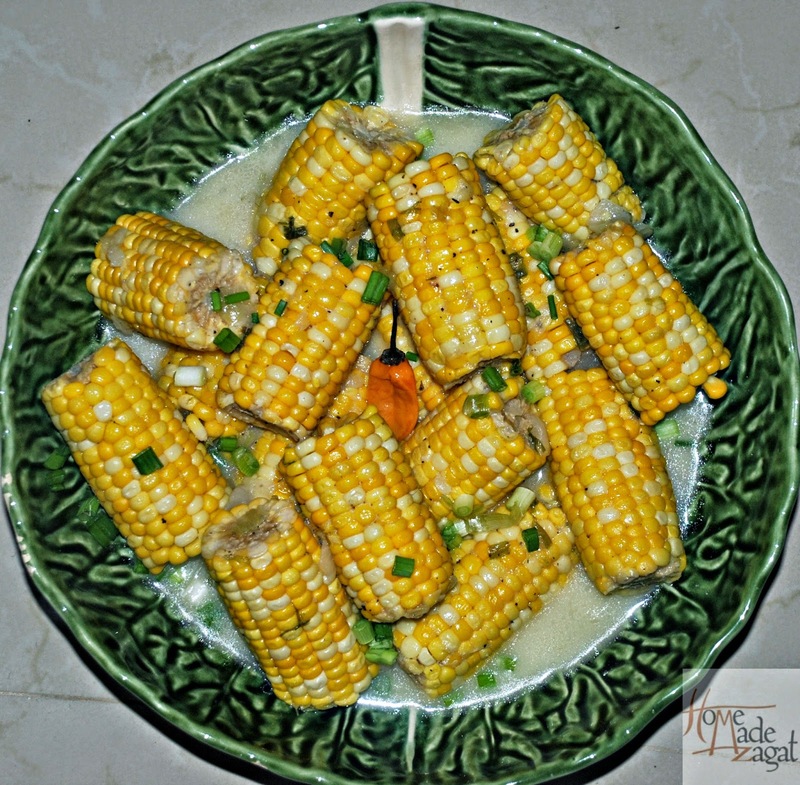 Boiled corn is another one of our street foods. Like our corn soup you can find it being sold at a lot of events: festivals, carnivals and is a common side at a house lime where there's partying and food. The process takes a little while longer but you would LOVE it. Corn, green onions, onion, coconut milk and a hot pepper for seasoning. Clean the corn cobs up as best as you can and you can cut or break them into sizes that are better to hold or if you have a lot of people coming. I cut each piece in half. It would also feel better in my pot. 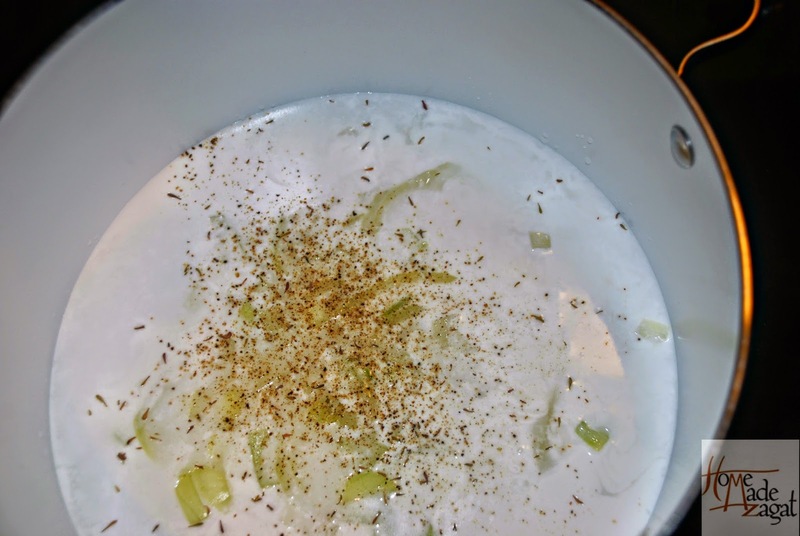 Add the can of coconut milk, onion, black pepper and salt to your taste. 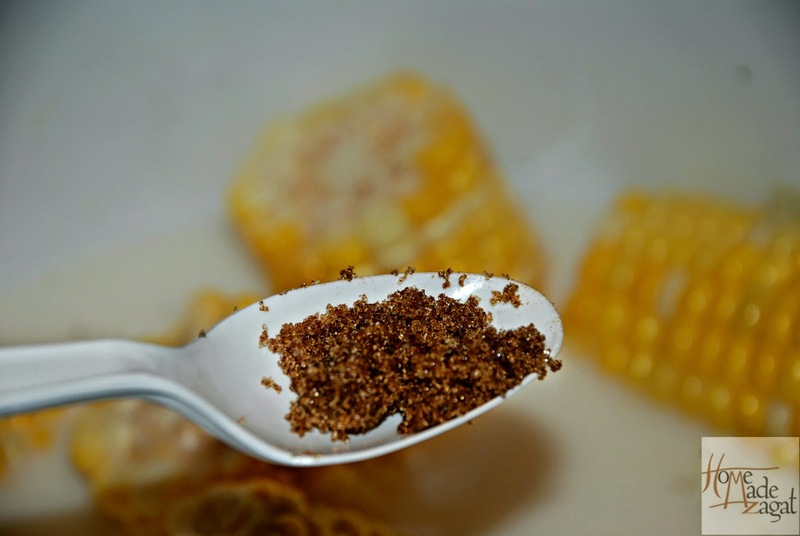 I also add a little bit of brown sugar to my mix. 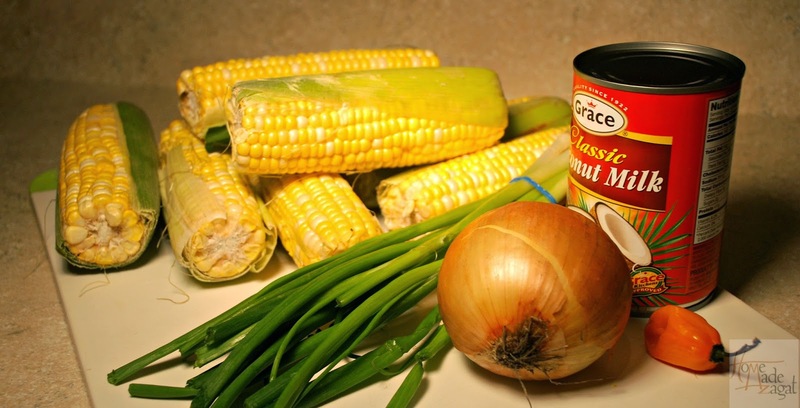 I then added my corn, about 2 tins (I filled the coconut milk tin with water) of water, green onion and my hot pepper. You need to have enough liquid to cover the corn so that it can boil in the water. Adding more coconut milk would give the corn too much flavor and also make it a oily. Let boil for about 15 mins. Liquid will evaporate to about 1/4 of original amount. Make sure corn is at the tenderness that you want. During boiling taste liquid to ensure that it's flavored as you want. BE CAREFUL NOT TO POP THE PEPPER!! 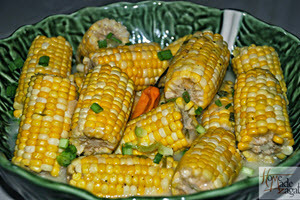 After corn is boiled and to the tenderness you like transfer to container and get ready to dive in!! Corn boiled in coconut milk, with additional spices. A favorite street food from Trinidad and Tobago. Add diced onions to milk and let boil. Boil for 15 - 20 minutes till corn is at tenderness you desire. 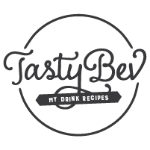 Tried this a few weeks ago...I have been looking for a decent recipe for boiled corn Trini-style for a while...the search is over...looking for more corn presently to repeat recipe...thank you! Thank you Stephen for taking the time to let me know. If you took pics send me some nah.. homemadezagat@gmail.com I love showcasing recipe attempts.